Hexavalent Chromium Test Strips with Concentration Color Chart - Order Now for Only $29.99! Concerned about Hexavalent Chromium in your water?... Just Check It! 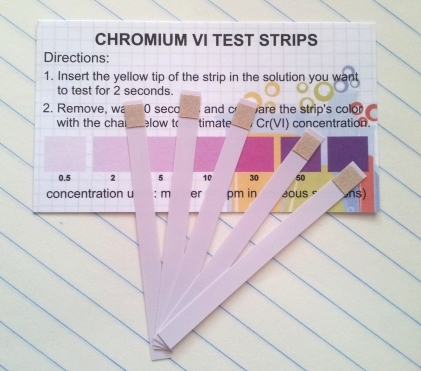 We're happy to offer our user-friendly Chromium VI test strips, including our specialty Cr +6 indicator and corresponding concentration color chart. Our easy-to-follow, fast and accurate detection method will tell you how much hazardous Chromium 6 is in your drinking water or food. It also makes for a great science fair project idea. Chromium 6 is a known a genotoxic carcinogen, meaning that it causes damage to genes, which in turn may cause cancer. Testing for Hexavalent Chromium is made easy by simply placing Home-Health-Chemistry's test strips in a water-based solution and comparing the color change to the provided reference card. The test strips contain the exact amount of indicator required for easy and safe handling. You will receive 5 Chromium VI test strips and an instructional card describing how to carry out the screening procedure, with a concentration color chart ranging from 0.5 to 100 mg/liter (0 - 100 ppm). You'll be able to check drinking water as well as solid samples by mixing or dissolving them into water. "Just Check It" and protect your loved ones. All financial transactions are handled exclusively by PayPal's secure payment system, and Credit Cards are accepted, so none of your personal financial information is transferred to us or stored by us (see our purchase policy for more information regarding ordering, shipping and product returns). Click here to view more test kits for detecting other hazardous chemicals, such as BPA, lead, parabens and cadmium as well as more great science project ideas.